Do you live near the San Francisco Bay Area? Come out, bring your guinea pigs, and get to know your fellow piggy loving friends at the Bay Area Pignic! 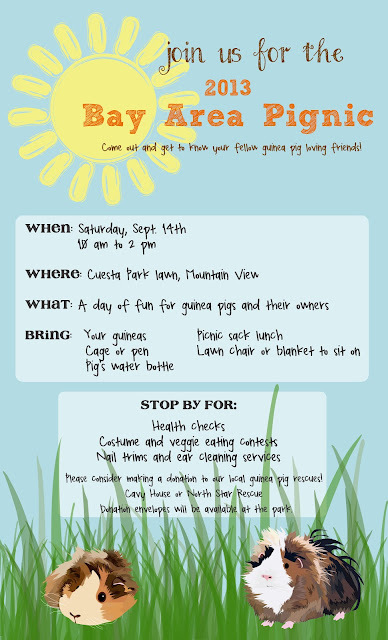 Meet other piggy people, squeal over all the cute pigs, and support our local cavy rescues. Cheer your pig on in the veggie eating contest, have a chuckle at the creative costumes, and get your guinea some grooming. Health checks and nail trims anyone? Revy and Abby-Roo had a blast at last year's event. Between making new friends and pigging out on the grass, both girls were completely tired out by the end of the day. We're super excited to be helping out this year! Anyone planning to attend? Will you be bringing your pigs along?